ST. PETERSBURG, Russia (AP) For Lionel Messi, the time is now. Time to score at the World Cup. Time to save Argentina from another crushing disappointment. Time to live up to his reputation as one of the world’s best players. Time to end questions about his performance in the biggest games. One thing there isn’t time for is celebration. Messi turned 31 on Sunday, two days before Tuesday’s must-win game against Nigeria. Nigeria would advance with a win, and a draw might be enough for the Super Eagles depending on group leader Croatia’s result against Iceland. Other stars have come through at this World Cup. Messi’s great rival, Portugal’s Cristiano Ronaldo, has scored four goals. So has Belgium’s Romelu Lukaku. Neymar has a goal for Brazil. Toni Kroos scored when Germany desperately needed it. His only medal with Argentina came 10 years ago – at the Summer Olympics – but other than that there have been only demoralizing defeats. Messi was kept quiet in the World Cup final four years ago as Argentina lost 1-0 to Germany. Messi also played for Argentina when it lost the Copa America final in 2007 – when he didn’t shoulder much blame because of his youth – and in 2015 and 2016. It was Messi’s hat trick – in the final qualifying match at Ecuador – that got Argentina to Russia in the first place. Considering he will be 35 at the next tournament, this may be his last chance. Tuesday’s game, therefore, is make-or-break not just for his country but also for him. So far in this tournament, he has missed a penalty – which was poorly taken – in the 1-1 draw against Iceland. Then he had a frustrating game in the 3-0 loss to Croatia. The widely accepted view is that Messi didn’t get enough help from his teammates and wasn’t getting the ball to his feet quickly enough to trouble the slick Croats. It’s a convenient argument when applied to most forwards, but Messi is unique and beyond comparison with all current players except Ronaldo. He is a five-time Golden Ball winner, a scorer of 552 club goals for Barcelona – not to mention 64 for his country – and dozens of hat tricks. If his teammates can’t find a way to play to his strengths, Messi should still be good enough to produce at least one moment of magic. There were rumors in the Argentine media that beleaguered coach Jorge Sampaoli wouldn’t even be on the field against Nigeria after players asked that he be removed. Argentina’s football association president, Claudio Taipa, put that talk to rest on Sunday, but he didn’t provide much clarity about the coach’s future. Sampaoli has a contract that runs through the 2022 World Cup in Qatar. Tapia didn’t respond to questions. 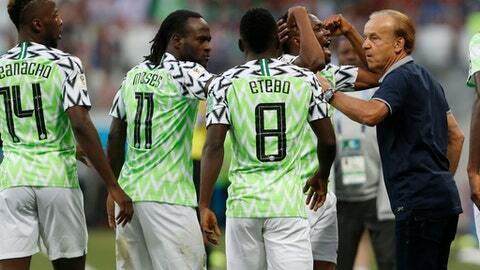 Now Rohr has a chance to cement his reputation by leading the Super Eagles into the second round, likely at the expense of Sampaoli’s job. Given how easily Croatia found holes in Argentina’s defense last week, Sampaoli’s defenders have good cause to dread facing Ahmed Musa. Musa’s searing pace allows him to hover around the midfield and attack from deep positions. This means Argentina’s defenders will be less inclined to push up for fear of leaving too much space behind them for him to exploit. It could end up impacting Messi too, since slowing Argentina’s passing game is the key to keeping him quiet. With defenders sitting too deep, this means a slower transition to the midfield and therefore less passing cohesion, and ultimately less possession for Messi. Argentina’s best bet is to score first and control the dynamic, forcing Nigeria to push forward and allowing Argentina to find Messi on the break.